Clean up continues on 26th street here in Baltimore, Maryland. I wake of Wednesday landslide which swallowed up 8 cars and homes being evacuated, footage of the landslide has emerged. The footage shows the exact moment the road collapsed onto the CSX track and you can hear residents in the background. See below! 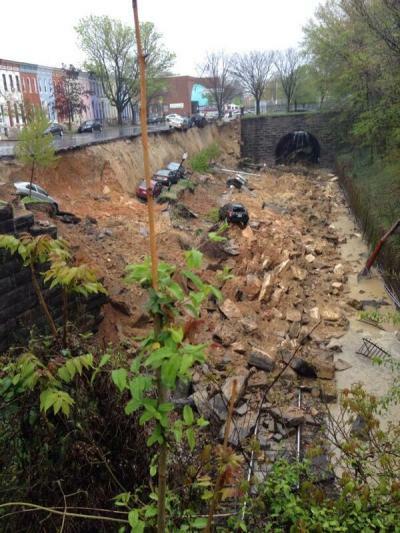 “Soil and debris from a mud slide in Baltimore have been removed from CSX Transportation tracks, and customer service restored over that line. However, nearby residents remain out of their homes as local officials assess the condition of the nearby saturated property. Around 5 a.m. today, trains in the area began moving again and operations resumed in support of Seagirt Marine Terminal. School is back in service. However, the city is putting replaced residents at the Hilton downtown. Next Post Kale Salad With Craisins and Apples!